Xenopus is a genus of highly aquatic frogs native to Sub-Saharan Africa with 19 species known collectively as African Clawed Frogs or Platanna. 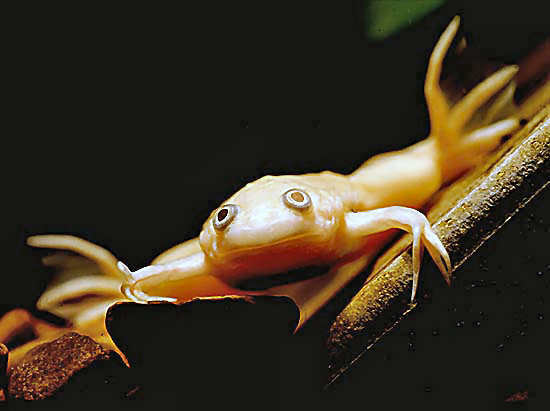 All species of Xenopus have flattened, somewhat egg-shaped and streamlined bodies, and very slippery skin. The frogs are all excellent swimmers and have powerful fully webbed toes, though the fingers lack webbing. The Surinam toad or star-fingered toad (Pipa pipa) is a species of frog in the Pipidae family found in Bolivia, Brazil, Colombia, Ecuador, French Guiana, Guyana, Peru, Suriname, Trinidad and Tobago, and Venezuela. The appearance of the toad is somewhat like a leaf. It is almost completely flat, and colored in a mottled brown. Here you may post messages or questions pertaining to all aspects and issues regarding the keeping, breeding, health, and conservation of any of the various types of clawed frogs including dwarf clawed frogs (hymenochirus), surinam toads (pipa), and common clawed frogs (xenopus)..